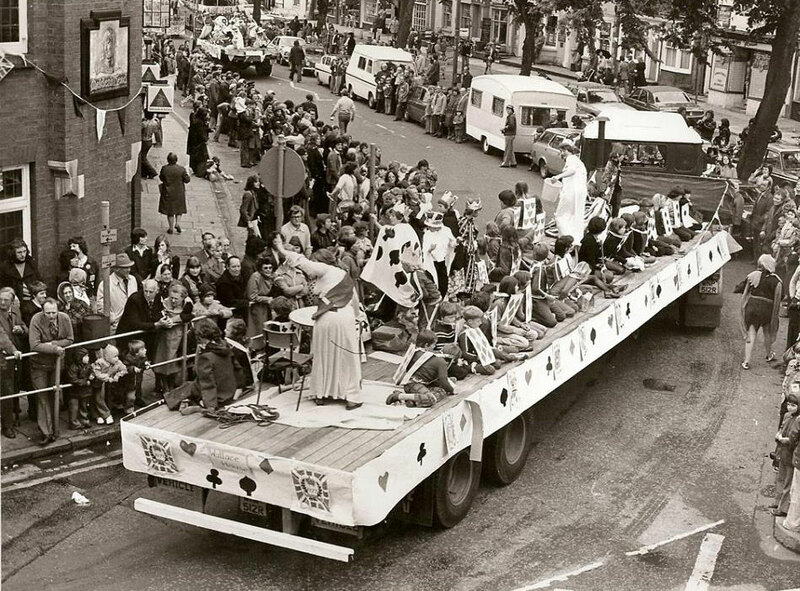 In the late 70s, approximately 1979, we got together with neighbours to produce a float for the carnival. We lived on Eastwick Park and most of the children were aged 6 – 10 years. We had the theme of the Robertson Jam’s Gollies and covered the float in huge cardboard jars of jam. We blacked out our faces and made wigs out of pairs of tights and loads of black wool. One of the dads had his own lorry and we decorated it on the street outside our house. We had a great time and were really proud to win first prize. 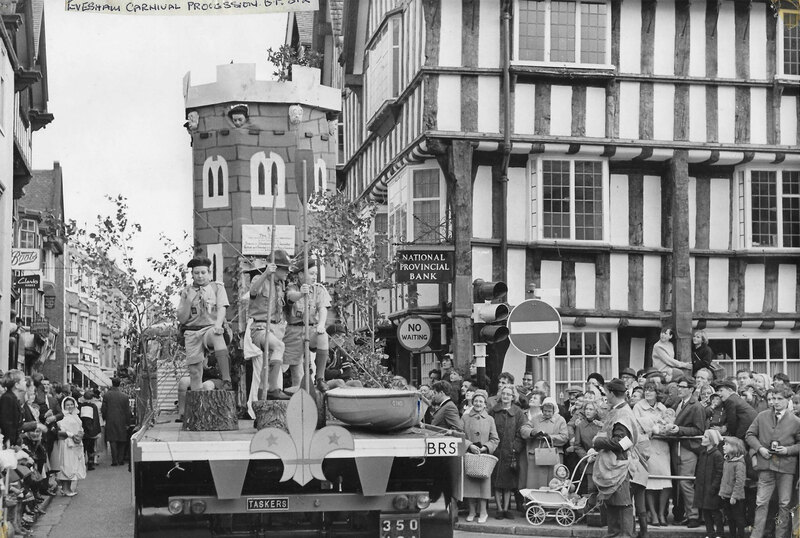 We took part in subsequent carnivals, one was Peter Pan with Swan Lane School and Evesham Swimming club had a float. I remember getting in trouble because we soaked the spectators – health and safety was about even in those days! First of all can I remember 30years ago when I won Miss Evesham? I remember being so surprised to win. As the one photo shows! I know I loved every minute of it. The day of the carnival. Was non stop excited.first off to the hairdressers to have my hair and make up done. Then back to put on my dress. Photos with the mayor and mattress. Out to lunch with the round table and ladies round table before the procession started. The excitement in the town.Was amazing. The crowds of people who turned out to see the carnival was unbelievable. I had the best day ever. Judging the best dressed teddy competition at nursery. Judging miss world competition at the ivy pub in the Littleton was hilarious. I loved every single minute of itSarah. And 30years on people still remember me being Miss Evesham. I am proud to be part of the carnival committee. I have so many happy memories. I can’t wait to be part of next year’s carnival. Why did we bring the Carnival back? In early 2014 the Facebook group Photos & Memories of Evesham really took off, and has gained over 5000 members to date. There were a lot of fond memories of Evesham Carnival forthcoming and it was clear there was a strong feeling among residents that Evesham wanted their carnival back!! As a person who doesn’t see the logic in voicing an opinion without being willing to take action, I organised a meeting for anyone and everyone to attend to see whether it was feasible to pull it off!! Raphael’s Ferry Cafe was full with people who wanted to help and it was lovely to see so many people with enthusiasm to get the ball rolling. From there The Round Table and some local volunteers have started putting together the Carnival’s return. Following a successful return in 2015, the carnival is now established as an annual event under the overall direction of Evesham Round Table.